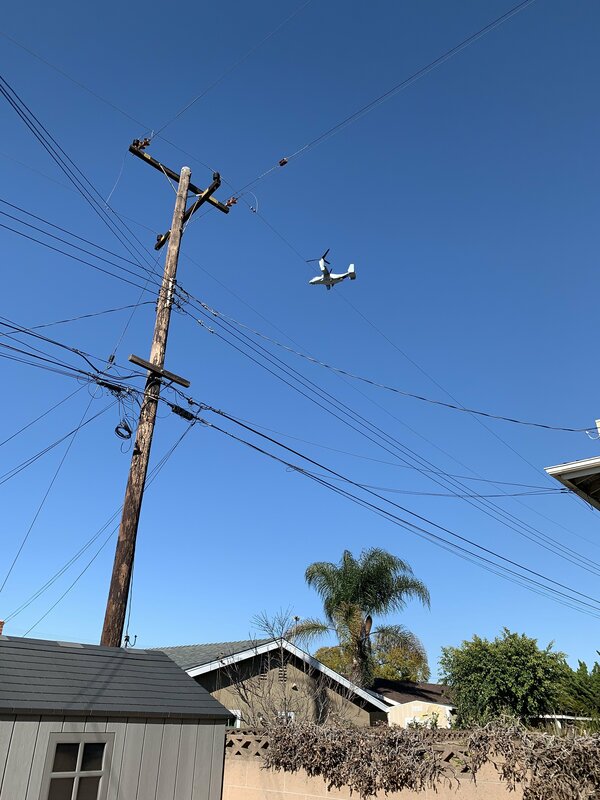 Two of these flew over my house today when I was assembling patio furniture. I live near Los Alamitos Air Force Base. What are they? I think they are very cool but they ain’t sneakin’ up on anyone. Osprey! Tactical transport. Marines if I remember correctly. 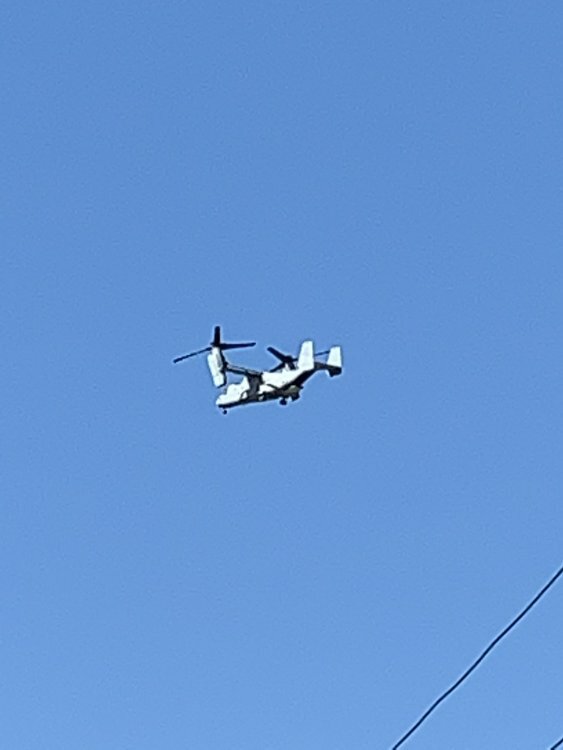 Yep V-22 Osprey Marines and USAF currently have them. Army and Navy will have them before long. V-22 Had some serious growing pains but now is combat proven. Takes off like a chopper. Flies like a plane. Tilt rotor vertical lift aircraft. Take of like a helicopter and fly like a fixed wing. 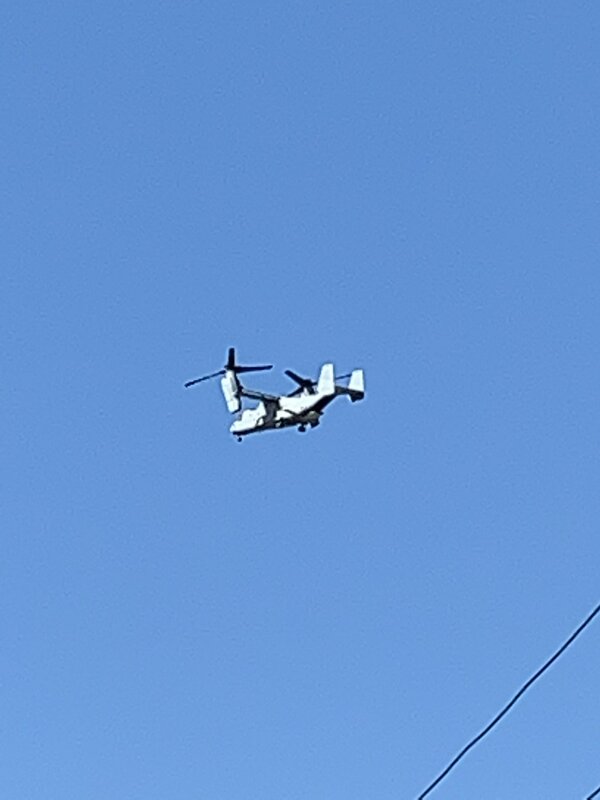 I live very close to MCAS Miramar Osprey's are flying over my house most days, It's kinda neat to see them transition from vertical to horizontal. It’s a failed concept that has cost many Marines their lives. There is zero use for this aircraft. The powers that be just couldn’t let this or death trap go to the scrap heap. V22 Osprey. We see them around here quite often, there is a bunch of them down at MCAS. Early on there were some fatalities but it’s proven to be a pretty good aircraft according to an officer I’m quite close to. They cost is 4-5 times as much as a Blackhawk, but Bell and Boeing somehow kept the project alive. I'm surprised it's still around. 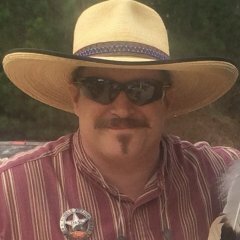 We were involved in making gears, shafts, and housing for them in 1986 when I was working for Western Gear Corp. in City of Industry, Ca. Almost everything on those things was out of spec from the day they were designed, but it all worked.....eventually. It’s funny, I had never seen one of these before. I thought they scrapped those long ago, but I'm no expert. The V-22 development holds the dubious distinction of having killed the most crew members of any new airframe. I saw two more today. Might have been the same ones. I can’t believe the army will get them. They lost the Caribou to the Air force and I don’t see much difference here. Funny how some of the best designs go by the wayside and those with numerous problems are chosen and perpetuated. The ability to take off and land vertically and to carry large ordinance and lots of troops are its biggest selling points. The fact that it can cover greater distances and do it faster and at greater altitude are advantages over normal rotary wing aircraft. I always thought that the Osprey was kind of a clever cross between a fixed wing cargo plane and a Chinook!! 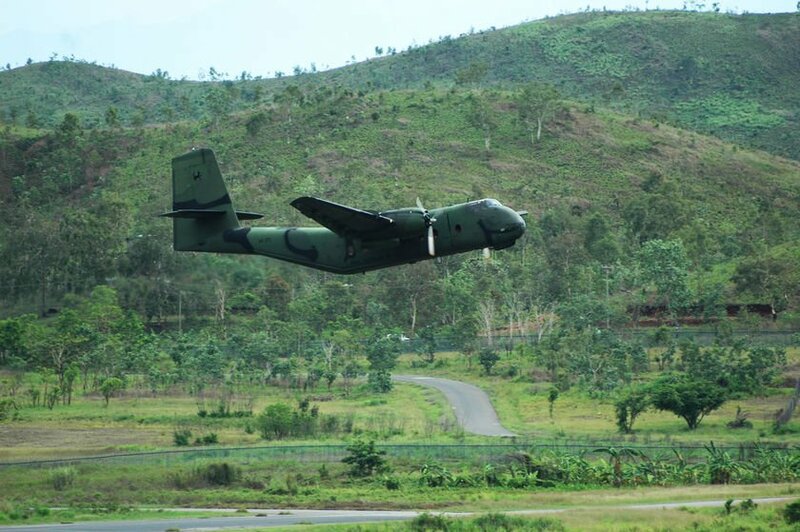 The C7A was the aircraft both fixed wing & rotary that I traveled by in RVN. I still can hear & feel the ruble of the twin wasp engines on takeoff. With full flaps there was almost zero clearance with the fuselage; so, there was loud rattling. Not the most reassuring sound the 1st time riding one. I know one thing, I like my new location. All kinds of helicopters and Ospreys flying in and out daily. It’s like a rotary wing air show around here during the day. Glad they don’t fly the Ospreys st night. Those things are attention getters with the mouse they make. Still a pretty handy aircraft. Just the ticket for Army ops. But the AirForce said it was too big and Strategic for the Army so they were all transferred to them. Australian pilots could fly the wings off em. Kind of like the Boeing 737 Max 8? That thing does a job, don't it? Air Force (politicians) want to kill it, troops on the ground wouldn't be without it. Supported those in Az for a few years. Flying Tank don't even begin to describe it. It's a BEAST!